As I’ve talked with food bloggers recently, interviewing them for the Chopped Podcast and in other discussions, I’ve begun to see some trends in the ways that food bloggers earn their livings. Believe it or not, they’re not all the same. 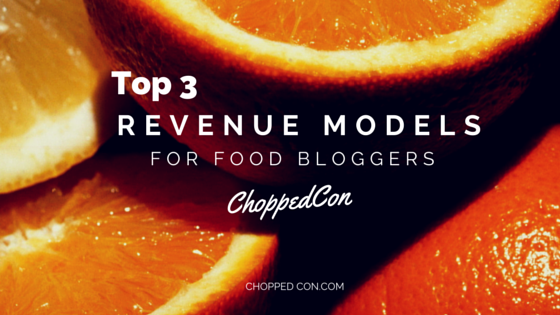 As a result, I put together this post on the Top Three Revenue Models for Food Bloggers that I’ve seen. My hope is that looking at the things you do within a certain model can help you feel more focused. It can help create a master plan for your blog so you can be more confident about what opportunities that come along are a good fit for you and your food blog business. The way I see it, there are three revenue models for food bloggers: Traffic Focused, Sponsored Post Focused, and Product Focused. A traffic-focused food blog is a fairly intuitive statement. In this scenario, the food blogger’s primary objective is a high number of page views, preferably over 100K per month. And, to be completely honest, according to data I heard in a presentation by Andy Marzka of AdThrive, aiming for 300K is probably more financially sustainable. Andy explained that with 300,000 page views per month and at $3 – $7 per CPM, you’d be making between $900 and $3,000 per month. There’s a lot in that graphic. So, let’s break it down a little. CPM = cost per mille (or thousand). 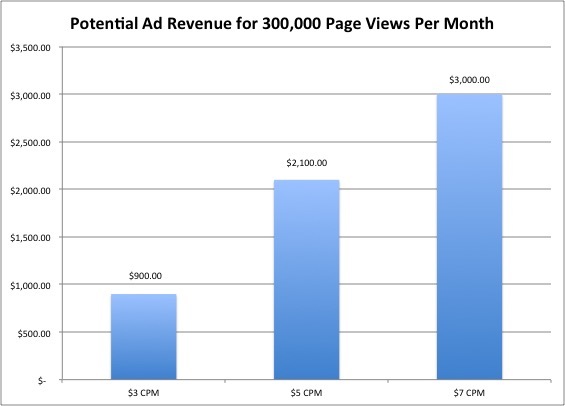 CPM is basically the cost of advertising 1,000 ads on your site. So, if you charge $3 CPM, an advertiser will pay you $3 for every thousand times its ad is shown on your page. If your page gets 300,000 page views, the advertiser will pay $300 ($3 X 300). Page View = the number of times a particular page on your site is viewed per month. What you want to keep in mind is that sometimes you may have an ad in two locations on the same page, in which case you will be looking at the ad’s impressions. This means if you have 2-3 ads on one page, the ad may have 2-3 three impressions per page view. You oftentimes hear that the trick to getting traffic is to create high quality content, but do you ever find yourself scratching your head and wondering what that means exactly? Well, what I’ve found is high quality content usually means information that’s helpful to your readers. It needs to be more than surface-level important too. There’s more information on creating compelling information below, so let’s move on. You can pump out one recipe after another, and that may generate interest in your blog, but what will create return visitors is when you begin offering something that draws in your readers. Maybe it’s an interesting story you tell. Maybe it’s techniques for preparing food. Or maybe it’s tools and resources like meal plans and diet tips. What causes you to go back to a site? Think about that a bit and see if you can create ways to apply some of these ideas, in a style that’s unique to you, on your site as well. Whether you use Google Analytics or other tools, understand your traffic. What are your main sources of traffic? Once you know that, think about ways you can encourage that to continue. If you get a lot of traffic from another blogger, consider reaching out to that blogger to foster an ongoing relationship. If you’re getting lots of traffic from Pinterest, try to understand why and do more of what’s working for you there. Social Media Examiner offers a great post on understanding the basics of Google Analytics. Built Analytics provides a more comprehensive Google Analytics tutorial if that better suits your needs. If you’re going to create a model of revenue based on traffic and you want ads to be a big part of that, you need to know how ads work. In Ads 101, you’ll want to know the lingo such as CPM, page views, impressions and the like described above. Beyond that, you’ll definitely want to learn more about the different ad networks, which ones will work best for your site, how to set up a waterfall system of ads, backfill and more. Does this all sound like Greek to you? I found a nice overview of Ad Networks for Food Bloggers you can use to begin your work of understanding it better. This knowledge is important to help you in negotiating terms with ad networks and for tracking your ad network stats. When your content is picked up by another site, saying thanks is a great way to let them know you appreciate their shout out. 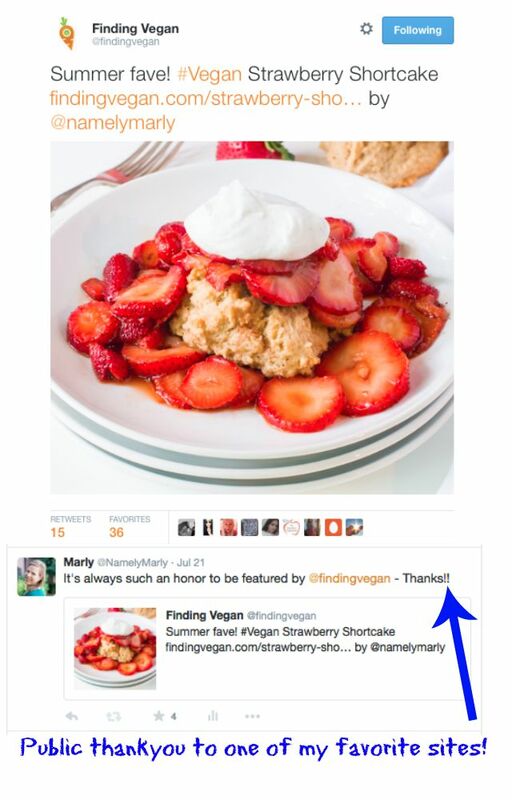 For example, I love submitting my recipe photos to Finding Vegan. It’s a site that is very aligned with my own and when my content is featured, it sends a lot of traffic my way. I interviewed Kathy Patalsky, the founder of Finding Vegan and Healthy Happy Life, for the Chopped Podcast and she talked about her favorite social media sharing strategies. One of my favorite tips is to say thanks. So when Finding Vegan features one of my recipes, I send a note of thanks, along with sending some good juju thoughts their way as well. Yes, that’s kind of woo woo. I know. But I appreciate the good things that come my way and wishing that in return for them as well just feels like the right thing to do. Here’s an example of a recent attitude of gratitude moment. There are a lot of Facebook sharing groups focused on sharing your content and reciprocally sharing/liking other people’s content. Do a search on Facebook for food sharing groups and pick one or two and ask to join. This part is important: know what the rules are for each group and follow them. Some will ask for a certain number of reciprocal responses. Others will ask for the entire list to receive a response. It’s important you get this right or you may be removed from the group. That’s no fun! Participate in programs like Ahalogy, TailWind, Buffer, and CoSchedule to schedule content for increased exposure. Everyone agrees that sharing content through social media — your own and others’ — is a great way to increase interest in your social media profile. You become the curator of high quality content that your audience is looking for. Scheduling that content out into the future may take a little bit of time today, but it means you can rest easy tomorrow. Well, at least you can rest easy on social media. You still have recipes to test, photos to take, posts to publish, and so on! Invest in promoted posts on services like StumbleUpon, Facebook and more. Every blogger has to ask themselves this question: what is my marketing budget? Is it zero? Well, then be prepared to put in lots of elbow grease to get your food blogging business up and running. But what if you decide you want to spend a little money to help promote certain posts? Some bloggers will get a deal with a brand and to make sure they have impressive numbers to show when the campaign is over, they’ll spend a little money to market that particular recipe. I previously interviewed Andrew Levine with StumbleUpon and he talked about how food bloggers can use SU’s paid promotion services. Similar strategies can be used for Facebook, Pinterest, and Twitter. I’m sure Instagram is on the waiting list. Gasp! Do guest posting and/ participate in link sharing to increase exposure. Guest posting is a great way to build exposure for your blog. Think creatively about the sites you can request to submit guest posting for, including other food bloggers. If some of the blogs you love take guest posts, put together a thoughtful pitch and reach out to them. Remember that popular food bloggers get a lot of pitches. What can you do to make yours stand out? Maybe include an amazing photo of one of your recipes. Maybe you could include a link from a previous guest post. Whatever you do, make sure the blogger you’re reaching out to understands what you have to offer them because, although they may not ask it, they’re probably thinking, what’s in it for me. Also, there are some sites that regularly feature guest posts or even regular contributors. Seek them out and understand how you can become a contributor to their site. Obviously this is just an overview. There are lots of posts and tips written on how you can increase traffic to your food blog. See which ones work best for you. A sponsored post-focused food blog is the next model we will discuss. In this scenario, the food blogger’s primary objective is reaching out and negotiating with brands or PR companies to receive compensation for posting brand-focused content on their site. I spoke to Rachel Gurk who regularly works with brands and she shared a lot of information about sponsored posts, some of which might actually surprise you. For example, if you think you don’t have enough traffic to be of interest to a brand, take heart. Rachel says that not all brands are interested in working only with high-traffic food blogs. So, if you’re feeling kind of glum about your current page view totals, but feel like you have a lot to offer, following the Sponsored Post-Focused Model might be a perfect fit. A Sponsored Post-focused blogger’s main goal is to create engaging content. A brand may not care about page views, but at the end of the day they have to report to their higher ups about the success of a particular campaign. You can bet that page views will be on that report, but they will also be looking at how much engagement their brand received as a result of their work with a particular blogger. Does this sound familiar? It may be the end-all and be-all of successful blogging. But when you create content that compels your audience, they can’t help themselves but want to comment. Maybe compelling means different things in different scenarios. For example, you could try being a little controversial. I did that on my blog by writing the post 10 Ways to Be Vegan. I had some seriously engaged (and sometimes even hateful) comments in response to that post. It makes me think I should write a Part II. But there’s more to being compelling than being controversial. For example, you can engage your audience by telling your story around food. Why did you become a food blogger? What is your food story? This, my friend, is how a blog becomes more than just one recipe after another. I believe it was Pat Flynn who coined the term Niche to get Rich (which only works if you pronounce it a certain way). Look, developing a niche, however you pronounce it, is a great way to create engagement. Your audience will become very focused and therefore you will be preaching to your choir. Do you see the advantage to this? A tight area of focus for your blog will help your audience feel connected with you. Find the social media platform that resonates with you and work it! I happen to have a lot of followers on my Namely Marly Pinterest profile. I think it’s because I just love that platform, but also because my audience there knows what to expect from my pins. Having great engagement on at least one social media network can make your pitch much more appealing to a brand. Which social media platform will you focus on? One of my Chopped Podcast guests, Amy Lynn Andrews has a great resource on How To Create a Media Kit. There are lots of other resources out there to help you put your media kit together. Think of a media kit like a one or two-page brochure about your site and your stats that you can provide to a PR firm rep or brand. It should be in a format that showcases your brand/blog and gives enough stats to help the other party determine if you’re a good fit for their marketing campaigns. If you’re worried about how brands will respond to your pitch, you might end up procrastinating the pitch. Let’s say you want to pitch your favorite brand, SunMunch (I made this up…obviously). And let’s say you’re postponing reaching out to them because you’re worried they won’t be interested in working with you. What’s the worst that happens? Well, let’s go down that rabbit hole and see. Let’s say SunMunch hate your pitch. Katy with SunMunch think your site is the worst one she’s ever seen. She puts you on their “Never Work With This Website” list. The entire company start badmouthing you on Facebook. They tell every other brand in the world not to work with you…just because you sent them an email. See? Now doesn’t that sound just a little over the top? More than likely what will happen is the brand will respond by saying something like, “Thanks for your email. We’d love to work with you!” Or “Thanks for your email. We are not working with bloggers at this time, but we appreciate your email and will keep you on our list for future campaigns.” Or you won’t hear back from them at all. Banish your fear of rejection and begin pitching your favorite brands today…that is if you want to pursue the Sponsored Post Revenue Model. Go to the brand’s website and look up their PR department. Typically you’ll find a generic email. But open a new tab and search for that company name + PR or press release. Hopefully you’ll find press releases published by that company. If you scroll down on that press release, oftentimes you’ll see a PR rep’s name. That’s how you can personalize your email to that company. Next, send a brief, to-the-point email to the brand. Dear Tana, I’m [your name] of [blog name] and we’re considering a new project and wondered if you’d be interested in working together. [Give a little bit of info about what you’re thinking about – 1 sentence, maybe 2]. We’d love to feature [brand name] as part of this campaign. Let me know if you’re interested and I’ll respond with more information. Obviously this is just an overview. There are lots of posts and tips written on how you can increase engagement and reach out to brands. See which ones work best for you. Cara Reed was on the podcast recently and she talked about how knowing your audience really helps to develop your voice. Cara did this by creating one person to embody her target audience. She named her Barbara. And Barbara, according to Cara, is a mother of a child with a recently diagnosed food allergy. Cara’s mission is to develop and share recipes to help Barbara fix fun and delicious recipes for her kids. If Jennifer stops by Cara’s site and leaves a complaint about one recipe or another, Cara is able to deal with it because she understands that Jennifer is not her target audience. Barbara is. It provides Cara the peace of mind to pursue her passion and develop her authentic voice as a blogger. Knowing your audience not only fills you with passion for your topic, it helps you create content directly related to your audience. It’s the kind of content that will inspire your readers to buy the products you want to sell as well. Don’t expect to sell a product it doesn’t have something of interest to your audience. This may take time on your part. You will need to create an outline and break the content down. And beyond quality content, you need to focus on the look nd feel of your product as well. Although we say you can’t judge a book by its cover, having some quality graphics or a stylized format for your ebook is important. Your quality content won’t mean as much to your audience if it’s not delivered in a cohesive, understandable format. There are lots of services you can work with to create quality graphics for your product. You can use a tool like Canva, or you can even hire a graphic designer through a service like Fiverr. Create an incentive give-away that is complementary with your product (or products) and begin growing your email list today. In the book Jab, Jab, Jab, Right Hook, Gary Vaynerchuck talks about the importance of cultivating your list by offering lots of great, free information. He calls these jabs. Then when you’re ready to sell your product, the right hook will be primed and ready to be delivered. It’s a bit macho for my taste, but it’s a process that makes sense. Provide lots of great, valuable information that has your audience tuned in, and then promote. Rinse, and repeat and you’ve got a great promotion strategy for future products as well. Even if you’re one of the best writers on the planet, to ensure you’re providing a high-quality product, it’s worth your time and your audience’s money for you to hire an editor to give you feedback and to catch errors that are impossible for you to see after hours and hours of looking at the same words. If you can’t afford to hire an editor, consider if you can barter with an editor. Exchange some business tools. Can you put an ad on your site showcasing their editorial services? Or maybe offer them an affiliate for the final product. There are opportunities for making this process more affordable. Maybe you have a friend who will step in as your editor and you can fix dinner for her or him in exchange. However you go about it, just make sure you get a qualified set of eyes to read your final product before it goes to market. Lindsay Ostram, of Pinch Of Yum, during her presentation at the 2014 Chopped Conference, said you don’t have to be THE expert in the product you develop, but you do need to be one or two levels advanced beyond your target audience. To be completely honest, being THE expert could make your content a little intimidating. The fact that you’re figuring this out and are on your own journey makes your content more relatable to your audience. So, if you plan to write an e-book on pastries, you simply need to know and feel comfortable sharing tips and strategies to help make the complicated recipes more do-able for your audience. Sometimes we put up unnecessary hurdles in our path. Remember this: done is better than perfect. One of my favorite authors, Julia Cameron, says to give yourself permission to write poorly. Isn’t that a funny thing to say? But it’s true. It doesn’t mean your final product will be bad, but you have to give yourself permission to get your content on the page. The first draft of anything can be terrible. In fact, usually the best things start out pretty crappy. Just go with it. Get it down. Then re-draft, and redraft again. Sit on it a few days and read it with fresh eyes. The next thing you know, you’re going to have a document that will mean something to your readers. Writing a book or an e-course is not easy work. It won’t happen unless you make it happen. I recommend scheduling time in your calendar daily. This could be an hour a day or more. It also may mean that for the next month (or more) you’re getting up at 5 am or skipping regular social activities. Take on the best productivity tips to help you stay on task and to give you the laser-like focus to stay on course. I interviewed productivity guru Jeff Sanders on the Chopped Podcast and he shared some great productivity tips that can help you get through your development process. Once your book or course is done, you need to create a funnel to promote it. Amy Porterfield offers instruction on a Product Launch Campaign that’s really helpful. Basically, you need to create a plan that gears everything toward the product sales page on your site. This could be a series of emails to your email list, or a series of posts on your site talking about your product. You could also do some guest posts on other sites or podcast interviews. Draw a small circle in the middle of a page and label it “sales page” and then draw concentric circles around it describing other things that you can do to send traffic to that page. That’s your sales funnel in a nutshell. You can create a product-focused food blog by following the tips above or by finding other resources to help you on your path. Either way, it’s good to know the options available to you. Food blogging is hard work. As a result, t’s easy to move in a thousand different directions and getting nowhere as a result. Knowing what direction you want to move in, and creating a strategy focused on that result, will help you achieve goals you never thought were possible before. Selecting a revenue model can help you develop a more targeted plan of action. It’s that simple. Most importantly, I hope you notice that creating compelling content is numero uno across all models. Having content that you’re passionate about and that your audience sees as a priority in your blog will be the most important thing you can do, regardless of the revenue model you’re pursuing. So, now it’s your turn. What did I miss? Anything you want to add or take away based on your experience? Share the graphic below and leave a comment to participate in the discussion. Thanks, Kathryne! I’m so glad you like it. Thanks for taking time to be one of our guests on the Chopped Podcast! This is amazing and has lots of food for thought – thank you! Hi Alyssa. We food bloggers love good food – whether the eating or the thinking kind! So glad you liked this post!